MSV: Stepping up, stepping down, the latest drama in a Ravi Bhalla Scam-a-Rama! Stepping up, stepping down, the latest drama in a Ravi Bhalla Scam-a-Rama! According to a late story today on the Hudson County View, the earlier MSV Premium rumor stating former Hoboken Mayor Dawn Zimmer and her husband Stan Grossbard resigned their Democratic Committee seats is true. City Council react to her proposed renegotiated Suez water contract. They were made Hoboken Democratic Committee members only last month and both have resigned. A HudCo Democratic Committee vote is set for June 12th. Former Mayor Dawn Zimmer, along with her husband Stan Grossbard, were appointed to serve on the committee as the representatives of District 5, Ward 4 back on April 8th. Multiple sources, who spoke under the condition of anonymity, confirmed that Zimmer and Grossbard had recently stepped down since they would not be available for the June 12th meeting for the new HCDO chair and didn’t want their votes to go to waste. 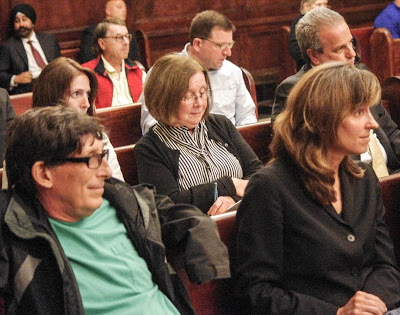 The HCV story goes on to say the upcoming Hoboken Democratic Committee meeting set for Thursday has an untold number of open committee seats that will be filled. Apparently, the surprising late entry by County Executive Tom Degise's daughter, Amy DeGise forced Ravi Bhalla's hand. Neither Dawn Zimmer nor Stan Grossbard is expected back in time for the vote as they are away on a long vacation. The HDC meeting later this week is apparently part of a last-minute political effort to burnish the numbers by Hoboken mayor Ravi Bhalla on behalf of State Senator and Union City Mayor Brian Stack. The long-time political powerhouse Stack is facing a surprising strong bid from Amy DeGise who is vying for the HudCo committee chair position. Earlier today, MSV reported Brian Stack expects Ravi Bhalla to deliver 60 of Hoboken's Democratic Committee seats but that figure appears well out of range. There are almost 80 seats on the HDC. Talking Ed Note: Is this what the now defunct Reform Movement voted for on the advice of outgoing mayor Dawn Zimmer?